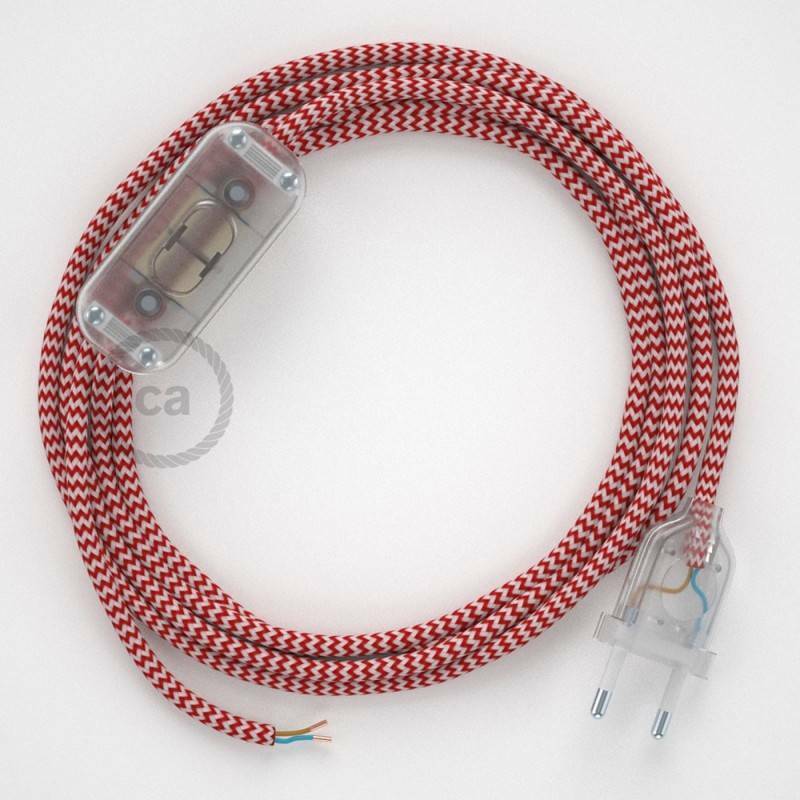 Lamp wiring, RZ09 Red ZigZag Rayon 1,80 m. Choose the colour of the switch and plug. 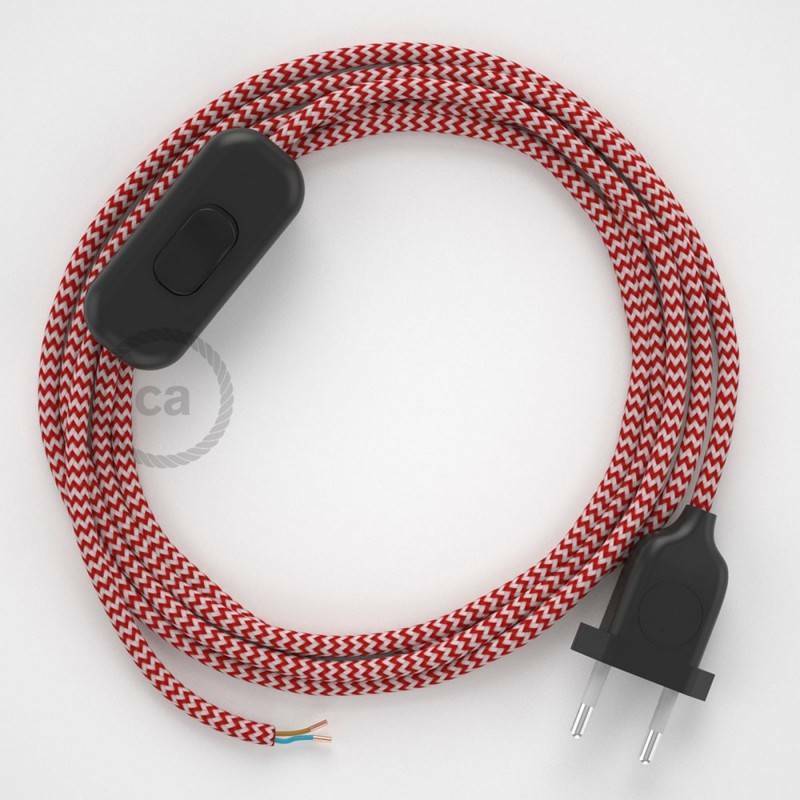 Give new colour to your table lamp thanks to the RZ09 Red ZigZag Rayon Round fabric cable, complete with switch and plug. 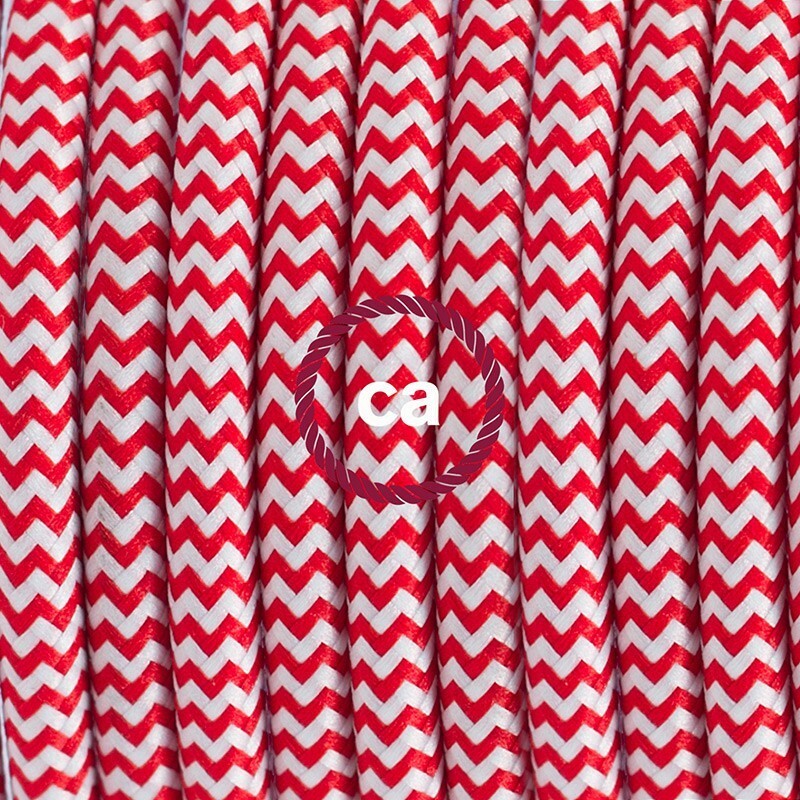 Cable colour: RZ09 Red ZigZag. 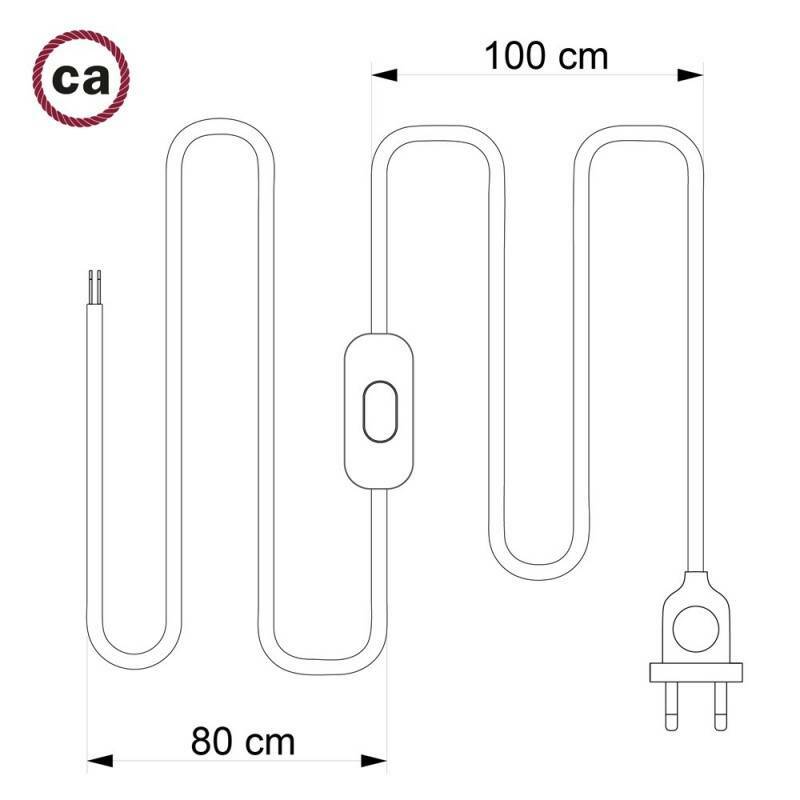 Length of cable: 1,80 m (100 cm from plug to switch + 80 cm from switch to end of cable) 2x0.75. Lamp wiring, RM21 Dark Green Rayon 1,80 m. Choose the colour of the switch and plug. Lamp wiring, RM22 Whiskey Rayon 1,80 m. Choose the colour of the switch and plug. Lamp wiring, RN01 Neutral Natural Linen 1,80 m. Choose the colour of the switch and plug. 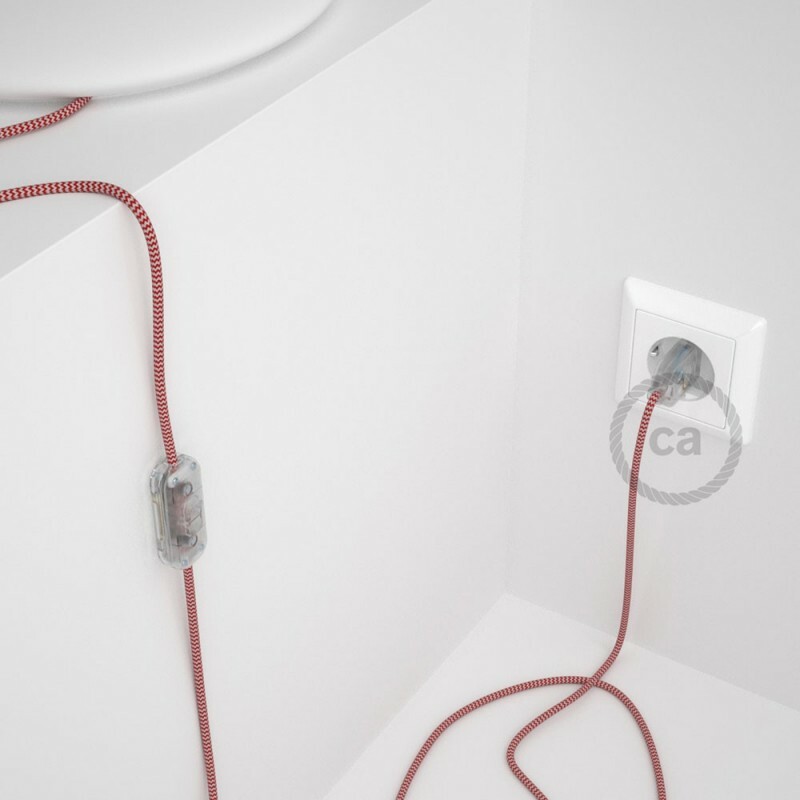 Lamp wiring, RN02 Grey Natural Linen 1,80 m. Choose the colour of the switch and plug. 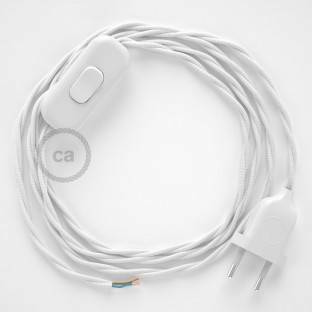 Lamp wiring, TM01 White Rayon 1,80 m. Choose the colour of the switch and plug. 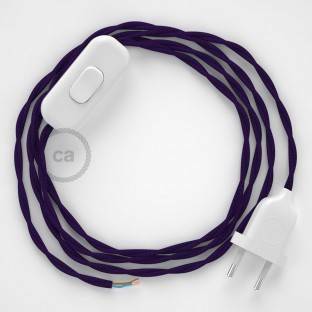 Lamp wiring, TM14 Purple Rayon 1,80 m. Choose the colour of the switch and plug. Lamp wiring, TM02 Silver Rayon 1,80 m. Choose the colour of the switch and plug. Lamp wiring, RL01 Sparkly White Rayon 1,80 m. Choose the colour of the switch and plug. Lamp wiring, RL02 Sparkly Silver Rayon 1,80 m. Choose the colour of the switch and plug. Lamp wiring, RL22 Sparkly Copper Rayon 1,80 m. Choose the colour of the switch and plug. Lamp wiring, RL03 Sparkly Grey Rayon 1,80 m. Choose the colour of the switch and plug. 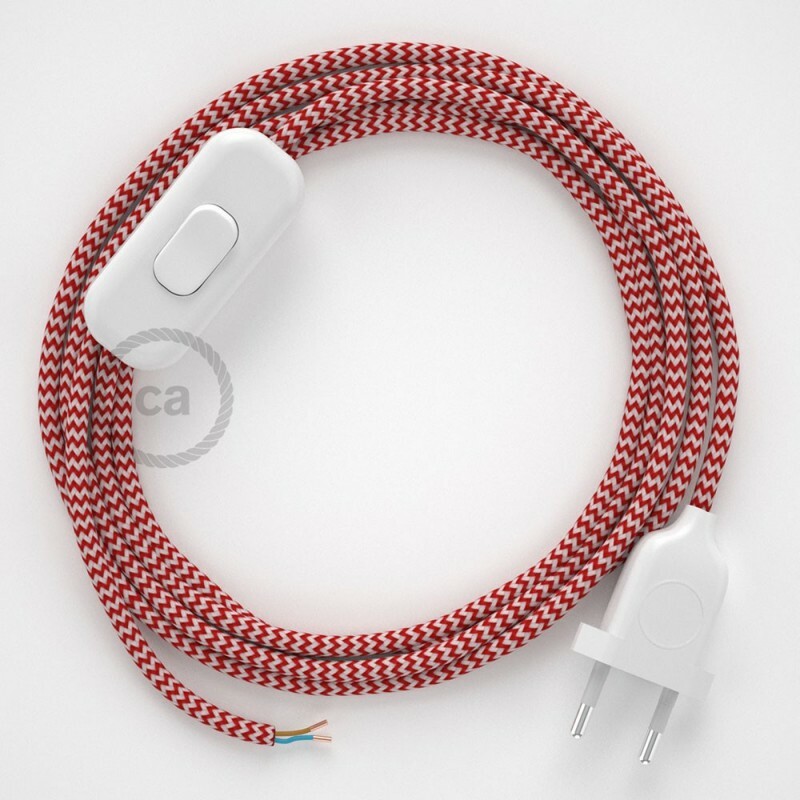 Lamp wiring, RP09 White-Red Two-Tone Rayon 1,80 m. Choose the colour of the switch and plug. Lamp wiring, RP04 White-Black Two-Tone Rayon 1,80 m. Choose the colour of the switch and plug. Lamp wiring, RZ06 Green ZigZag Rayon 1,80 m. Choose the colour of the switch and plug. Lamp wiring, RZ07 Lilac ZigZag Rayon 1,80 m. Choose the colour of the switch and plug. Lamp wiring, RZ15 Orange ZigZag Rayon 1,80 m. Choose the colour of the switch and plug. Lamp wiring, RZ08 Fuchsia ZigZag Rayon 1,80 m. Choose the colour of the switch and plug. Lamp wiring, RZ10 Yellow ZigZag Rayon 1,80 m. Choose the colour of the switch and plug. Lamp wiring, RZ11 Turquoise ZigZag Rayon 1,80 m. Choose the colour of the switch and plug. Lamp wiring, RZ12 Blue ZigZag Rayon 1,80 m. Choose the colour of the switch and plug. 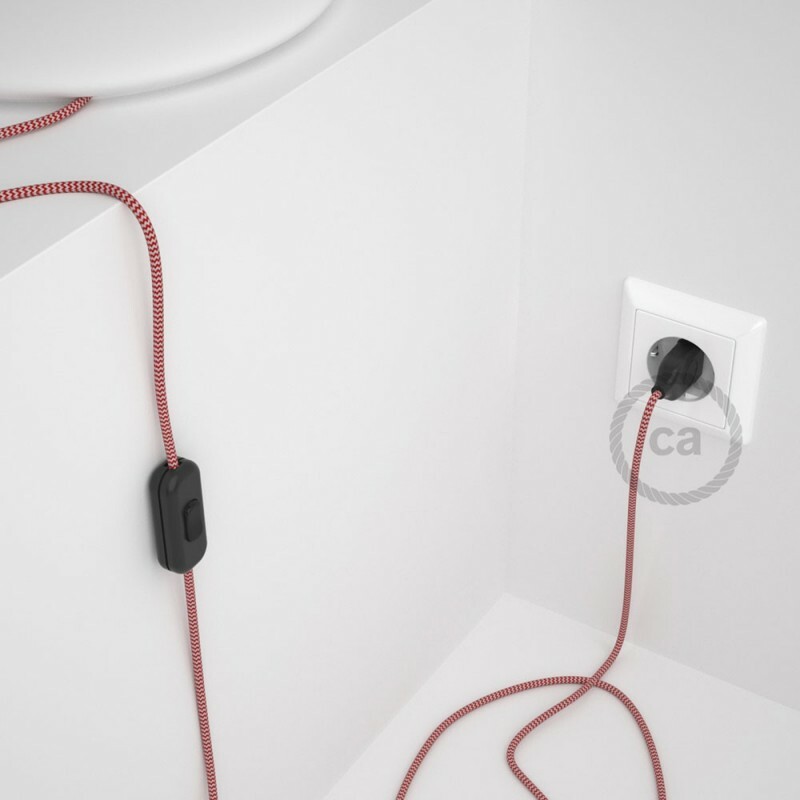 Lamp wiring, RZ04 Black ZigZag Rayon 1,80 m. Choose the colour of the switch and plug. Lamp wiring, RL13 Sparkly Brown Rayon 1,80 m. Choose the colour of the switch and plug. Lamp wiring, RN03 Anthracite Natural Linen 1,80 m. Choose the colour of the switch and plug. Lamp wiring, RN04 Brown Natural Linen 1,80 m. Choose the colour of the switch and plug. Lamp wiring, RD73 Bark ZigZag Cotton and Natural Linen 1,80 m. Choose the colour of the switch and plug. Lamp wiring, RD63 Bark Diamond Cotton and Natural Linen 1,80 m. Choose the colour of the switch and plug. Lamp wiring, RD53 Bark Stripes Cotton and Natural Linen 1,80 m. Choose the colour of the switch and plug. Lamp wiring, RD71 Ancient Pink ZigZag Cotton and Natural Linen 1,80 m. Choose the colour of the switch and plug. 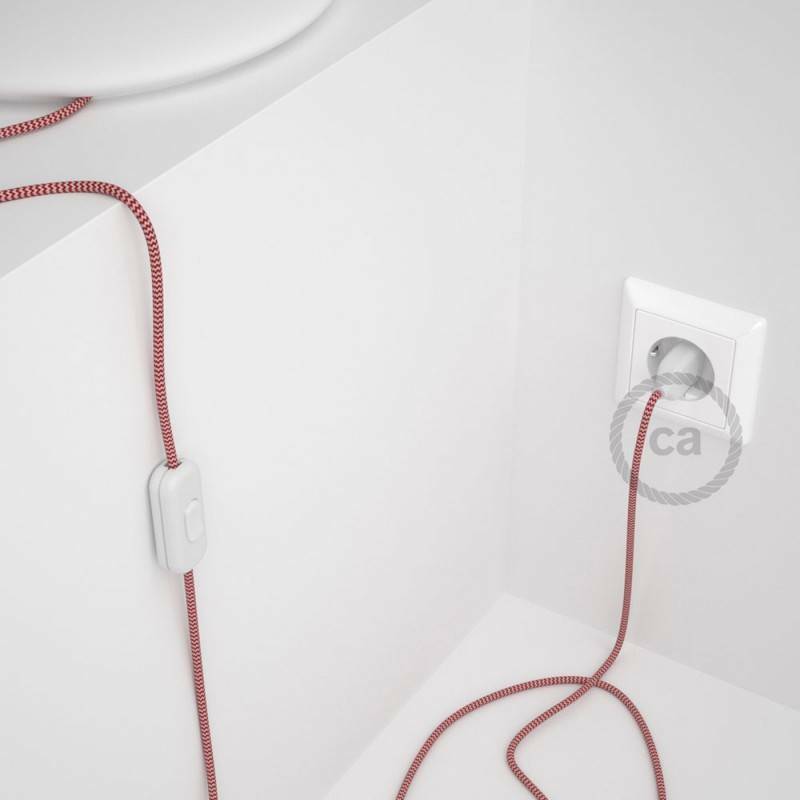 Lamp wiring, RD61 Ancient Pink Diamond Cotton and Natural Linen 1,80 m. Choose the colour of the switch and plug. Lamp wiring, RD51 Ancient Pink Stripes Cotton and Natural Linen 1,80 m. Choose the colour of the switch and plug.